Summary: Microsoft Scripting Guy, Ed Wilson, talks about using a free Windows PowerShell module to run Windows Update on a computer. Microsoft Scripting Guy, Ed Wilson, is here. One thing that is a bit disappointing is that Windows 8 and Windows Server 2012 do not come with cmdlets to permit me to run Windows Update from inside Windows PowerShell. A couple years ago, I wrote a series of scripts and functions that talk about using the Windows Update API to do this, but I do not want to mess around with a bunch of scripts. Luckily, I do not have to. Michal Gajda wrote a Windows Update PowerShell Module that is available from the Scripting Guys Script Repository. All I need to do is to download the module, unblock it, and copy it to a centralized location. The Windows Update PowerShell Module consists of a number of scripts. Once I download them, the PSWindowsUpdate.zip file is blocked. 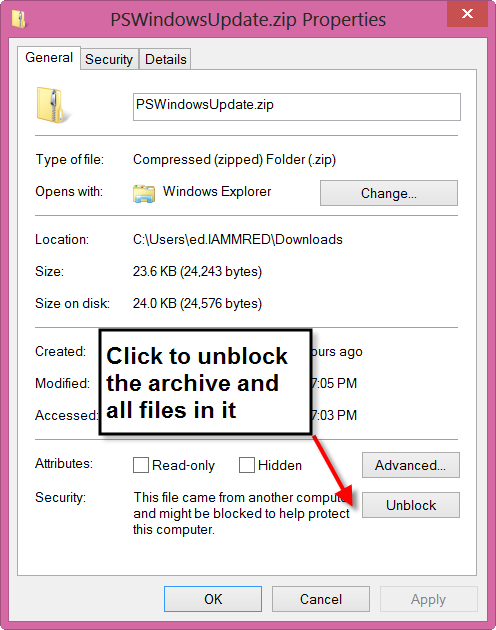 There are Windows PowerShell cmdlets now that will unblock files, but it is easier to use the graphical tool from Windows Explorer, if I download the script from Internet Explorer, as shown here. Now that I have unblocked the archive, I extract it and copy the contents to a server with a shared folder exposed. This command is shown here. Now I need to import the shared module. This command makes sense, but is a bit stealth … that is, it is not really intuitive. Instead of simply supplying a module name, I include the complete path. I need to run the Windows PowerShell console with admin rights because the commands require admin rights to update my computer. Remember, modules are addressed by their folders that have the same name as the module itself; therefore, I simply type the path to the shared folder containing the module. The good thing is that tab expansion works and will fill out the path for me (to avoid misspelling of path names). The command is shown here. Once I have imported the module, I use the Get-Command cmdlet to view the commands available to me. This is shown here. The command (advanced function) I want is called Get-WUInstall. There is complete comment-based Help, and the advanced function is extremely powerful. I recommend spending some time getting familiar with the options. By default, it connects to Windows Update, presents a listing of available updates, and prompts to accept. (There is an acceptall switch that will automatically accept the updates). On my computer, I ran the advanced function with defaults, and found a video driver I did not know existed. This is shown here. Other hardware – NVIDIA Quadro 2000M[226 MB]?” on Target “EDLT”. If I want to know if I need to reboot the computer, I use the Get-WURebootStatus function. This is shown here. If I need to perform a reboot on Windows 8 and Windows Server 2012, I can call the Restart-Computer cmdlet. But even on Windows 7 (or Windows XP, for that matter) running Windows PowerShell 2.0 and the Get-WUInstall advanced function, there are switches for reboot. For example, there is the AutoReboot switch as well as the IgnoreReboot switch. Now I can configure my remote servers and use Windows Update to perform the updates. Cool. It think it will require a bit of scripting to be on the safe side, but the cool thing about Windows PowerShell is that if something does not exist by default, someone in the community generally steps up to the plate. Thanks to Michal Gajda for writing and for sharing a cool module.